More than 25 varities are available in it. Select your best combination and enjoy the sweet bite. Anjeer Nutkhat - Anjeer, Badam, Kaju, Sugar, Silver Leaves. Rose Sweet - Rose Petal, Kaju, Sugar with or without Anjeer. 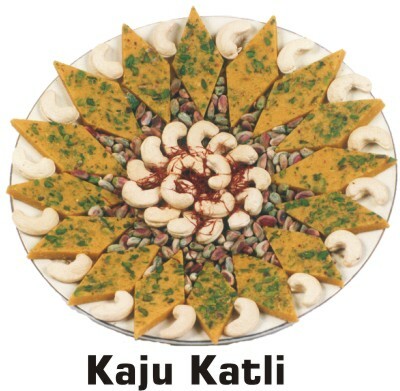 Cholesterol Free Kaju Katli- It will come in two types. One with silver foil and one with kesar and pista slice on its top.